A devoted chocolate lover will always be sure to tell you about the health benefits of their favorite sweet treat. “It’s full of antioxidants, it’s good for your heart and it prevents cognitive decline,” one will say while shoveling down a box of chocolate truffles. Like lovers of red wine, chocolate addicts have a myriad of scientific studies to back up their claims, the collection of research into cacao suspiciously disproportionate to less delicious foods. 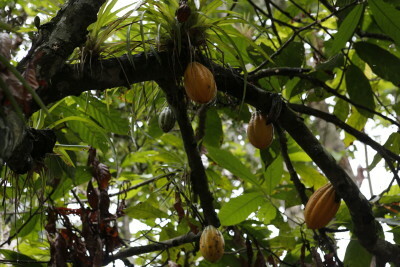 Cacao pods growing on Cacao tree. Chocolate lovers are right, in a way. At the heart of every bar of chocolate there indeed lies an ingredient with many proven health benefits. The problem is, the cacao bean is usually so overwhelmed by the milk, sugar and other ingredients that are added to chocolate that it has little room left to do its good work in your body. Knowing this, many people wisely opt for dark chocolate because it has more cacao beans and less milk and sugar. Fresh cacao pods cut open to show the cacao seeds. 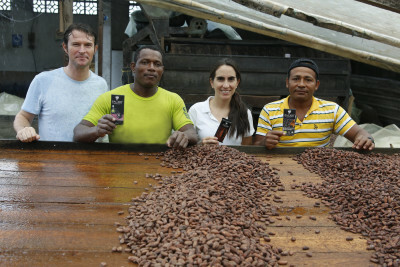 Chicaoji takes cacao bean purity a step further by using the raw cacao and nothing else. 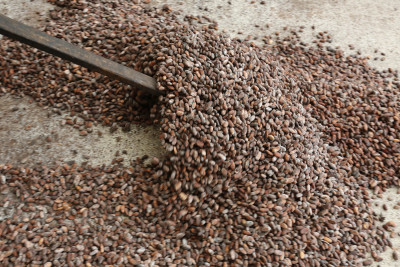 The cacao ‘nibs’ in Chicaoji are cacao beans that have been broken into smaller pieces. These nibs taste somewhat bitter on their own, but when they are blended with sweet agave nectar, they impart a flavor that chocolate lovers will recognize well. 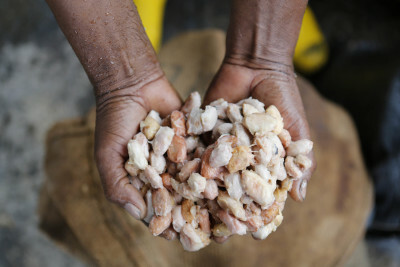 Using raw cacao beans in Chicaoji allows us to share some of the nutrient dense compounds in cacao that have fueled chocolate’s good reputation. Fresh cacao seeds just removed from the cacao pod. Cacao beans are widely considered to be the best source of antioxidants, easily overtaking antioxidant-rich foods like green tea and blueberries. A bitter-tasting compound in cacao beans called epicatechin has so many health benefits that some researchers say it should be considered a vitamin. Epicatechin is usually removed from processed cacao because of its intense flavor. The polyphenols and magnesium found in cacao are both good for heart health. Cacao is a natural anti-depressant, promoting a positive mood with safe doses of dopamine, serotonin, tryptophan and phenylethylamine. 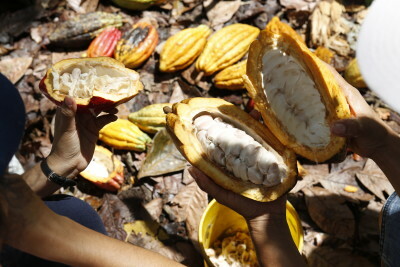 Raw cacao seeds are fermented in boxes to remove the natural coating from the seed pod. 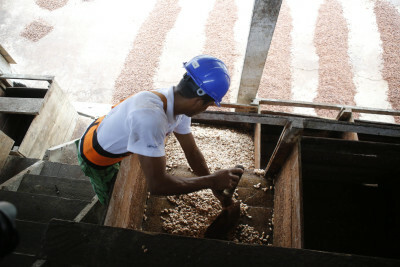 Floor drying cacao seeds using hand tools. Taste the natural goodness of Pacari© cacao nibs in Chicaoji. Special offer to celebrate Pacari, Chicaoji’s cacao supplier: 15% off until the day after Valentine’s Day, February 15th. This discount not available for the full cases (12) which already are significantly discounted. Enjoy Pacari’s delicious selection of premium organic chocolates. We are honored to work with this family oriented business that brings such integrity to an essential food. I want to thank Alia O’Connell for helping me compose this blog article. I very much enjoy her style of writing. She does a great job of ordering my jumbled thoughts and ideas. I made only a couple of edits for emphasis. Alia is available to help you with your needs for well-composed English. Photo credits go to Pacari. I used images from their website for this post. 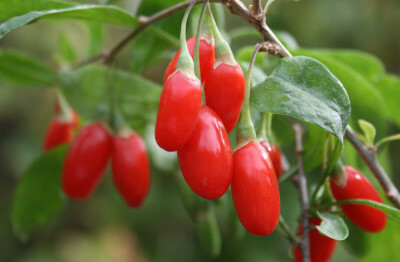 If you know that food is medicine, then you understand Chicaoji. Thank you for reading the Chicaoji blog! Loaded with a full spectrum of flavors, Chicaoji can satisfy any type of food craving that you may have be it spicy, salty, tangy or sweet. If you’re looking to delight your sweet tooth without making it ache, the subtle sweetness of Chicaoji won’t disappoint. Chicaoji’s sweet spot is derived from agave nectar, a natural sweetener that is made from the blue agave plant of central Mexico. Agave nectar is a rather new type of sweetener that has gained a lot of popularity thanks to public demand for sugar alternatives. 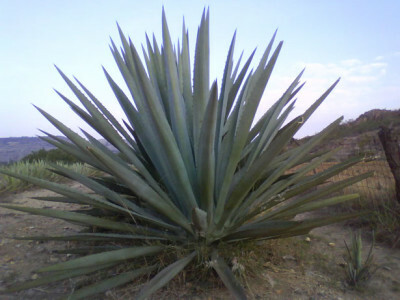 In the late 1990s, agave farmers who would have otherwise used the green desert plant to make tequila began manufacturing sweet agave nectar from the plant’s core. Though modern agave nectar is more syrup-like, the native Aztecs have been flavoring their foods with sweet “honey water” obtained from the agave plant for thousands of years. In a market teeming with alternative sweeteners, agave nectar has stood out in the crowd for a number of reasons. First, agave nectar has a fantastic and complex flavor that does a lot more than just provide a hint of sweetness. Because agave nectar is slightly sweeter than sugar, you don’t have to use as much of it in your morning tea, coffee or smoothie. With a consistency that is silkier than honey, agave nectar blends easily into sauces, stir-fries and salad dressings. While agave nectar is highly regarded for its rich but subtle flavor, the sweetener is also valued for its low glycemic index. People who are diabetic or overweight choose agave nectar to sweeten their foods because it has low levels of glucose and measures a relatively low score of 32 on the glycemic index. In fact, agave nectar has a lower glycemic index than honey, another popular natural sweetener. Another reason agave nectar is a superior sweetener is that it is a raw and organic food. After the sap is extracted from the agave plant, enzymes are added in the same way that a bee uses enzymes to produce honey. The agave nectar remains at a low temperature (under 118°F) during the entire production process, unlike maple syrup, which is boiled. People on a strictly raw food diet can incorporate agave nectar into a variety of different raw recipes. Agave nectar going into blender at Chicaoji Central. 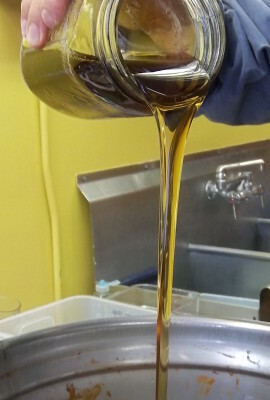 We use organic raw blue agave syrup from GloryBee to add a touch of sweetness and agave flavor to Chicaoji. The light agave nectar sweetens the raw cacao nibs, providing a subtle “chocolaty” taste that is a key component of Chicaoji’s greatness. Indulge your love of sweet things without the sugar by flavoring your foods with Chicaoji, and create your own sweet recipes with blue agave nectar from GloryBee retail website. I want to thank Alia for composing this blog article. I very much enjoy her style of writing. She does a great job of ordering my jumbled thoughts and ideas. Alia can help with your need for well-composed English for your blog, website content or term paper. What began as a simple friendship between cacao nibs and goji berries became something extraordinary when smoky chipotles stepped onto the scene. Chicaoji certainly wouldn’t have become the chief condiment in the cabinet without the spicy heat provided by its boldest ingredient. As the only part of Chicaoji that cannot be considered totally raw, smoky chipotles bring the zing and carry the fire. Many people don’t know that chipotles are actually ripened jalapeño peppers that have been dried over wood smoke. If jalapeños are allowed to mature, their well-known green coloring gives way to a deep red. 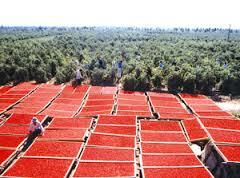 The Aztecs in Mexico smoke dried these red peppers as a way of preserving them before the advent of refrigeration. Necessity birthed delicious invention, and smoky chipotles have remained a staple in Mexican and Mexican-inspired cuisine. The smoky chipotles that we use in Chicaoji are sourced from Mycological Natural Products in Eugene, Oregon. 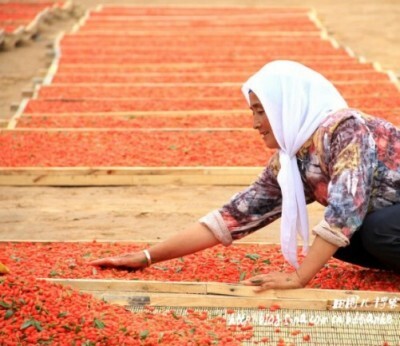 When the naturally preserved peppers arrive at Chicaoji Central, we harness their fiery temperament to create a medium spiciness that can be enjoyed by many. With a noticeable heat that’s not too overwhelming, the smoky chipotles won’t steal the show from the other flavors in Chicaoji. Like every ingredient that goes into Chicaoji, smoky chipotles are there to provide both flavor and nourishment. Of the many nutrients in chipotle peppers, the most notable is capsaicin, the organic chemical that gives jalapeños their spicy flavor. Capsaicin has been found to energize the metabolism, improve blood circulation and help burn calories. Researchers from Nottingham University have even determined that capsaicin triggers cancer cell death without harming healthy cells in the body. In addition to capsaicin, chipotle peppers are a great source of dietary fiber, vitamins and minerals. Chipotles contain healthy doses of iron, phosphorous, magnesium, potassium and vitamins A, B6, C and K. Incorporate these vitamins and a little capsaicin heat into your diet by flavoring your meals with Chicaoji. You can also add smoky chipotles to your own recipes. Go to Mycological Natural Products for more info. These days, it’s hard to find completely raw and unpasteurized foods outside of a home kitchen. Even many of the raw vegetables that are sold at supermarkets have been treated by ionizing radiation, also known as cold pasteurization. While pasteurization is used to kill potentially harmful bacteria, the process simultaneously kills much of the nutritional value from the good bacteria in the foods. The raw apple cider vinegar that we use in Chicaoji contains so much good, healthy bacteria that pasteurizing it would be like taking a paint roller to the Sistine Chapel. Keeping our sauce raw and unpasteurized allows our customers to enjoy the “Mother of Vinegar” from Spectrum Organics with every flavorful bite. Though the process of staying raw requires expensive and tedious USDA and WSDA approval, enhancing the flavor and health of our sauce with raw apple cider vinegar is well worth the effort. Vinegar is an ancient health tonic and cooking ingredient that cultures around the world have incorporated into their diets for thousands of years. All vinegars have been used for their flavor and energizing properties, but apple cider vinegar has a long history of being used specifically as a medicine. The ancient Greek physician Hippocrates was known to prescribe apple cider vinegar to treat various infections, and soldiers in the American Civil War used apple cider vinegar to facilitate faster wound healing. While apple cider vinegar is a popular folk remedy, many of its well-known health benefits have been confirmed by scientific research. In numerous studies, apple cider vinegar has been shown to stabilize blood sugar levels, kill harmful bacteria and reduce blood pressure. Apple cider vinegar is also known to reduce fatigue and provide a healthy energy boost, thanks to its potassium, enzymes and amino acids. The natural fermentation process that is harnessed to create apple cider vinegar is a fascinating miracle of nature. When raw apple juice meets a complex of yeast and bacteria known as the “Mother of Vinegar,” the sugars are transformed into alcohol. With exposure to oxygen, the hard cider is further transformed into acetic acid, or the main ingredient in vinegar. By allowing this natural process to take place in a controlled environment, the result is a delicious, tart-tasting vinegar with numerous bioactive components. Many people take raw apple cider vinegar with water as part of their daily health routine. Others get more creative with the tonic by adding it to salad dressings, marinades, soups and smoothies. You can incorporate raw apple cider vinegar into your diet quickly and easily by topping your meals with a little Chicaoji. Place your order for Chicaoji HERE. Find raw apple cider vinegar from Spectrum Organics HERE. 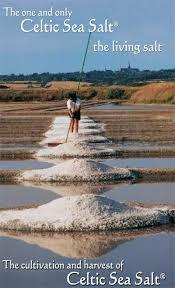 Like the ocean water that composes most of our blue planet, cooking with salt is a fundamental part of life on Earth. Collected from the Earth’s oceans and ancient sea beds, salt is an abundant gift that can be used to elevate the taste of other foods and supplement our bodies with an array of essential nutrients. Because salt is such a key cooking ingredient, many people overlook its potential health benefits and take the natural stuff for granted. Seeing salt only as a flavor enhancer, the uninformed chef may choose a highly processed table salt to cheer on the real stars in their recipe. Table salt, which is a combination of pure sodium chloride and anti-caking agents, pails in comparison to the subtle Earthly flavor and rich mineral composition of a real sea salt. The powerful ingredients in Chicaoji would accept no less than a true “salt of the Earth” to share a bottle with. That’s why we use light grey Celtic Sea Salt® by Selina Naturally to intensify the flavors of the raw goji berries, cacao and chipotle chile peppers in Chicaoji. While Celtic Sea Salt® aids the other ingredients in reaching their full flavor potential, the dissolved grains also impart their own subtle taste sensation into each bottle. 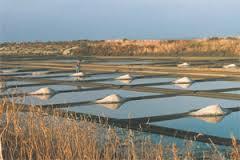 Celtic Sea Salt® is a completely unrefined grey salt that is collected by hand and then dried with sunshine and wind. The natural collection process allows the salt to retain moisture from the seawater and a light grey hue from the clay-lined salt beds where it is found. Moist and grey, Celtic Sea Salt®’s unique appearance are evidence of the fact that it has not been bleached and diluted by additives and has thus retained its rich mineral composition. Healthy food is preventative medicine, and countless health care professionals have recommended the use of Celtic Sea Salt® in a balanced diet. Not only is Celtic Sea Salt® a great source of sodium and magnesium, it contains dozens of trace minerals that can be difficult to find in other foods. As our bodies are mostly composed of salt water, Celtic Sea Salt® helps feed our internal ocean waters the nutrients that they need to produce electrolytes and maintain proper functioning. Flavoring your meals with Chicaoji is an easy and delicious way to obtain your daily dose of Celtic Sea Salt®. Order Chicaoji today to enjoy the benefits of adding a real sea salt to your diet. Use discount code “salt” for 10% off your purchase at chicaoji.com/shop . You can also stock your kitchen cabinets with Celtic Sea Salt® by ordering from our supplier at SelinaNaturally.com. I want to thank Alia for composing this blog article. I very much enjoy her style of writing. She does a great job of ordering my jumbled thoughts and ideas. I made only a couple of edits for emphasis. Alia can help with your need for well-composed English. I believe food is medicine. Let me tell you one reason why I believe. My liver failed in 2010. The doctors at St. Joseph’s Hospital in Bellingham, WA used some pretty fancy drugs to forestall my immediate death. After a few days they sent me home, signed up for Hospice Care (meaning less than 6 months to live), with a 30% chance of living more than a month. They offered palliative (pain relief/end of life) care. Now it is 2014. My liver function has returned to normal (according to allopathic doctors) and I’m well enough to keep the business part of Chicaoji going with a lot of help. I want to share my path in broad terms to let you know that effective alternatives exist to Western “allopathic” medicine. Eastern medicine takes an entirely different approach to healing. Many factors guide the Eastern healing Path including things Western medicine doesn’t consider relevant. My path may not be your path but I offer this glimpse hoping you or someone you know may benefit. I want to share with you how it is I ain’t dead yet from liver disease: Food is Medicine. St Joseph’s allopathic doctors accomplished an amazing technological feat by pulling me through the first critical days of liver failure. Without their help I’d be dust in the wind. My wife, Annie, was not satisfied with their terminal prognosis. We had just gotten married after being friends for 25 years. She looked around for another option here on Lopez Island because I wasn’t well enough to travel. Gratefully, she found Helen Sanders, a practitioner of Eastern medicine, a player of the Scottish Bagpipes and a martial arts enthusiast. Helen came to our home when I was too ill to travel, even here on little Lopez Island. She looked me over and said right away that she wasn’t sure she could help….but she would try. Our first hint of her profound integrity. The first thing Helen did was take my “pulses”, look at my tongue, inquire as to the qualitative details of my defecations and ask other unusual (for me) questions. Then she put me on a diet of Congee and “green drink”. Congee, for me, was a mixture of certain kinds of brown and white rice and sea weeds. Green drink is a juice made with mostly green vegetables. In my case, it was kale, lettuce, cucumber, parsley (lots of parsley) and a few other green vegetables. The congee is made by soaking the rice for 24 hours and then cooking on low heat for many hours with LOTS of water. She provided a specific list of seaweeds to use which changed over time. I ate this rather plain congee and green drink for many weeks. At the time it seemed like a great many weeks. As time passed, we slowly began to add things like ½ teaspoon of molasses, a banana and then an egg!! I can tell you that ½ teaspoon of molasses adds a LOT to a bowl of congee. We eventually added more foods guided by the idea that food is medicine. Steamed or pan roasted root vegetables and salads came along all in good time. After months passed, Helen offered certain specific herbal concoctions and acupuncture treatments for my condition as it continued to evolve. Annie took meticulous care of me and worked closely with Helen to help me heal. Now I eat a wide variety of foods. Congee remains a regular part of my diet. I’ve learned to avoid foods that have undesirable consequences for me. This way of looking at food as medicine differs from how we usually think of “eating foods that are good for us”. Specific foods are prescribed to treat conditions. Long story short: With Annie’s help and Helen Sanders’ guidance, I did not die as expected. You may know someone who has liver disease with a terminal prognosis (or not). First ask them if they want to live. If they say yes, then find yourselves a practitioner of Eastern medicine. They’ll need help if they are as sick as I was. There’s more to the story. Let me know you are interested and I’ll tell more. Congee might sound boring to you but to me it is the taste of life. Add 2 tablespoons (more or less to taste) to a cup of cream cheese. Smoosh all together and eat with chips, toast, or veggie sticks.